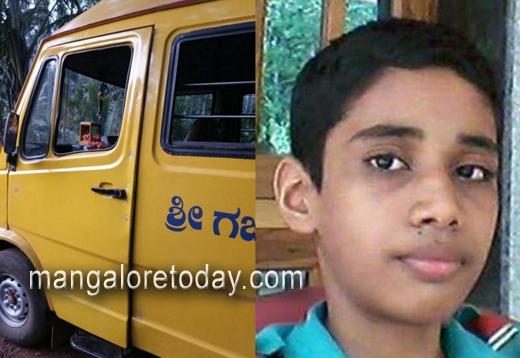 Puttur, Nov 11, 2018: A tenth standard student of the Gajanana English Medium High School of Eshwaramangala lost his life when he accidentally fell off the school bus while the vehicle was negotiating a curve at Pattladka on November 10, Saturday evening. The deceased is Gagan Alva (15), son of Padmanabha Alva and Prema of Badagannur village. It is said Gagan was standing on the footboard of the bus when its door opened suddenly and he fell on the road. Though he was immediately taken to a hospital at Eshwaramangala and then to Puttur, he breathed his last due to severe injuries to his head. The incident has once again thrown spotlight on the issue of safety of students in school buses.